Hi again, I diecut this butterfly from some leftover glossy card pounced with alcohol inks. I love the polished stone effect. I recently bought some yupo paper so am going to have some more fun with these inks these school holidays. I'm linking up to the challenge at Time Out where they have this amazing inspiration pic. I was inspired by the gorgeous Autumn colours and the arched shape for my tag. 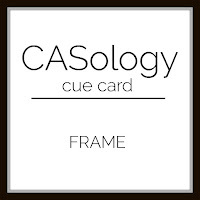 At CASology the cue card is frame. Memory Box Darla butterfly die; MFT pierced & traditional tag stax dies; alcohol inks & glossy card; Darice Fall leaf embossing folder; gold rub on paint; antique linen distress ink; sentiment sticker. Pretty colors on this polished stone butterfly! Love the tag and the embossed background! Cathy, this is so pretty! I love how you framed your tag and that butterfly is gorgeous! Thanks for playing along at CASology! Those alcohol inks blended so well and made a stunning butterfly. It looks so pretty on that embossed background. Your butterfly is absolutely gorgeous and I love the embossing behind it! Thanks for playing along with CASology this week! The detail on the butterfly is absolutely stunning! So gorgeous!